Fifty-five years ago today, a president sparked the imagination of a generation and set in motion what many consider to be the greatest coordinated effort in human history. 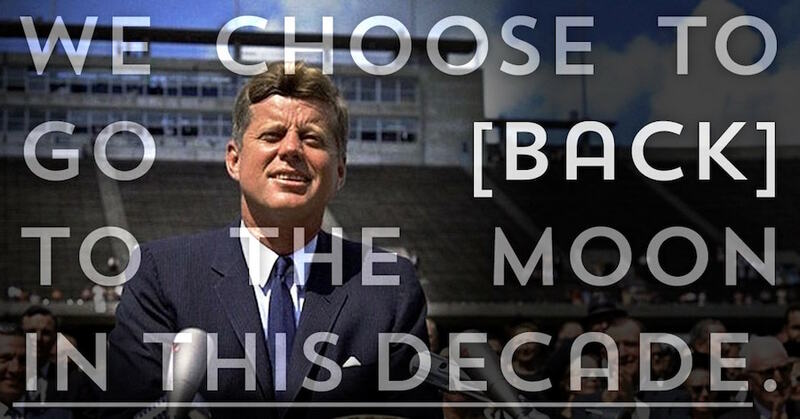 On September 12th 1962, President John F. Kennedy announced to the world that the United States would endeavor to land a man on the Moon before the end of the decade. NASA engineers and researchers took up the challenge, and the American public took to the idea with gusto. Less than seven years after Kennedy’s speech, on July 20th 1969, the crew of Apollo 11 landed the Eagle module on the lunar surface—and humankind took its famed giant leap forward into interplanetary exploration. The momentous events of the summer of 1969 have left an indelible mark, not only on the aerospace industry, but on decades of popular culture as well. While dreams of moon-bases and lunar colonies may have been ignited by the success of Apollo 11, our sole reliance on the government to forge our future in space has, unfortunately, left many disappointed with the pace of progress. In the last few years, however, our dream to create a sustained human presence in space, and indeed on the Moon, has roared back to life thanks to the audacious goals of entrepreneurial space companies. These entrepreneurs, and the investors who back them, are leading humanity back to the Moon and beyond. That’s why today, on the 55th anniversary of Kennedy’s Moon speech, Space Angels is excited to announce the launch of The Space Angels Podcast. In each episode, Space Angels CEO Chad Anderson interviews influential space entrepreneurs to better understand their bold plans to create a future with millions of people living and working in space—and ultimately, to help investors gain insight into the opportunities and risks of early-stage space investing. In our podcast’s inaugural episode, Commercial Lunar Ambitions, Chad interviews John Thornton, CEO of Astrobotic—one of the most influential leaders in the entrepreneurial space sector, and who is currently planning the world’s first commercial mission to the Moon in 2019. As a companion to this first episode, we thought it fitting to focus this week’s article on the evolving commercial lunar landscape, and explore the ways in which today’s space race is distinctly different from that of the iconic Apollo era. Fifty-five years after President Kennedy’s landmark address, today’s space race features new players and different motivations. In 1962’s speech at Rice University, John F. Kennedy quoted Plymouth Bay Colony founder William Bradford, who in 1630 noted that “all great and honorable actions are accompanied with great difficulties, and both must be enterprised and overcome with answerable courage.” These words have held true throughout the centuries, and remain as applicable today as they were when invoked by President Kennedy in the early ‘60s. At Space Angels, it is our strongly-held belief that, in our generation, the people who carry the mantle of this ‘answerable courage’ are not only the young men and women who are risking their lives to go into space, but also the entrepreneurs who are putting everything they have on the line to build a future in space for all humanity. Much has changed since the days that the world’s governments held a monopoly on the space race. Today’s race to the stars involves a host of specialized private companies, supported not only by government interest and initiatives, but also (and in large part) by private sector investments. In this way, today’s space ambitions are being shaped by entrepreneurs and angel investors as much as by government space agencies. Another stark difference between the space movement of the 20th century and this new entrepreneurial space age are the underlying motivations for exploration. Kennedy’s 1962 missive was borne out of national pride, fueled in large part by latent Cold War-era tensions between national governments. Today, our journey into space is motivated by the economic expansion of human enterprise. Rather than playing into an “us-versus-them” competitive dichotomy, this new space age hinges on exploring the possibility of economic expansion off-planet—a notion bolstered by the innate human urge to push the boundaries of what’s possible. This shift in motivations also denotes a significant change in the end goals of modern space companies and agencies alike, especially as concerns the Moon: Rather than visiting our celestial neighbor to prove we have the ability, we’re now going back to the Moon with the intention of maintaining an extended presence of the lunar surface. NASA’s call for commercial lander proposals underscores the changing face of the modern space industry. In early May of this year, NASA posted an official Request for Information (RFI) that piqued the space industry’s interest in a major way. The agency was looking for domestic vendors interested in, or capable of, developing commercial payload landing services for future missions to the lunar surface. This RFI was seen as the latest in a series of indications of NASA’s interest in partnering with private companies to return to the Moon—and last week, the agency affirmed this goal. 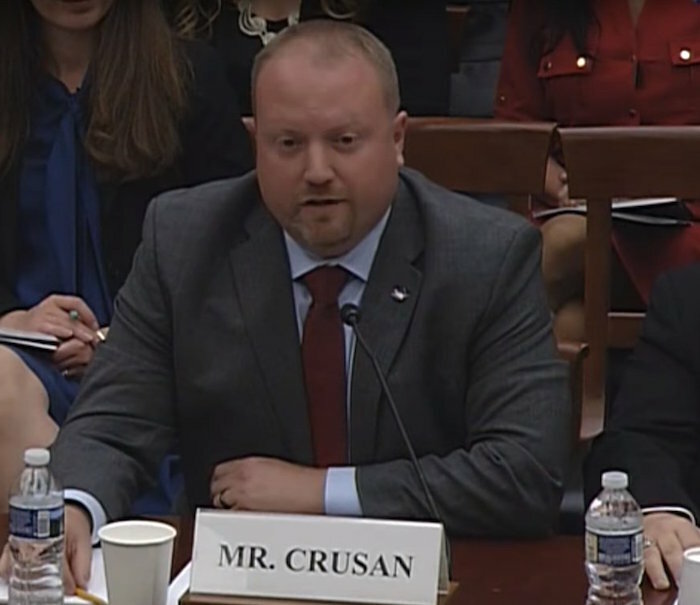 On September 7th Jason Crusan, NASA’s Director of Advanced Exploration Systems confirmed in testimony before the House of Representatives space subcommittee that NASA is preparing to formally solicit commercial transportation of payloads to the Moon’s surface. The move is an enormous boon to the growing commercial lunar services sector, and signals the agency’s increased reliance upon, and confidence in, today’s private space industry. The impending solicitation also highlights another hugely important difference between the Apollo-era space race and today’s space age: How exploration is financed.The modern commercial space movement is, well, commercialized—put simply, the design and development of modern space technology is built upon financially-sound business models, market demand, and paying customers, rather than strictly government-funded cost-plus contracts. And while there has never before been more private investment in space companies, this is not to say that government agencies have a lessened role within today’s space race—in many ways, it’s precisely the opposite. As noted above, agencies like NASA have proven instrumental in fostering the development of commercial space companies. NASA’s new contract model provides recipient companies with fixed-price contracts, supplemented with milestone payments in recognition of significant technological achievements. Often, these contracts will also ensure that recipients have an engaged, active customer once their technology becomes viable—in effect, NASA represents many private ventures’ first paying customer for their technologies and services. Beyond lessening the agency’s financial burden in the early stages of R&D, NASA’s contracts also provide increased incentive for competition between private ventures—competition which will inevitably hasten innovation and shorten product/service lifecycles. NASA’s forthcoming solicitation for commercial lunar landers also has the potential to facilitate the development of a virtual fleet of deep-space landing vehicles, each with varying capabilities and core competencies—effectively multiplying the practical potential of planetary technologies while minimizing government investment. Commercial lunar services represent the future of humankind’s relationship with the Moon—and with space in a broader sense. The fact is that private industry, backed by both agency initiatives and forward-thinking angel investors, will be heading to the Moon in the very near future. For discerning space enthusiasts, the name to watch is Space Angels-funded Astrobotic. While we went to the moon as a “one-off” in the Apollo era of the 1960s and ‘70s, Astrobotic is taking us back to the Moon for good. 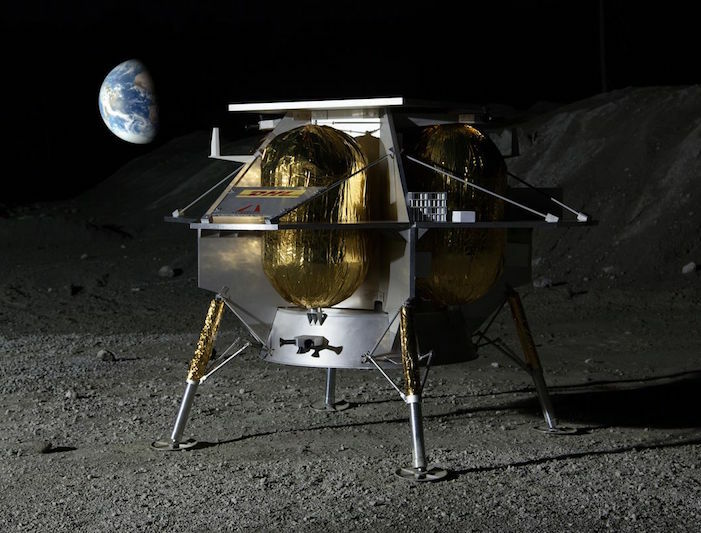 Since its founding in 2008, Astrobotic has made it their mission to develop commercial payload transportation services to the lunar surface. The company’s emphasis on customer service informs a smart, sustainable business model focused on reliability and partnership. In pursuit of this goal, the company has designed, developed, and extensively tested their Peregrine lander—which is now officially signed-on to launch aboard a United Launch Alliance Atlas 5 rocket in 2019. And this maiden voyage will be no mere test-run: Astrobotic’s lander will be laden with eleven customer payloads—from six different nations—and will deliver them to the surface of the Moon. Astrobotic’s customer base includes not only government agencies, but also research institutions and private companies looking to establish their own commercial activities off-planet. While a commercial Moon delivery service may seem like a novelty to some, Astrobotic CEO Jim Thornton knows that such a service fills a very real need in the marketplace—in fact, as Thornton explains to Chad Anderson in this week’s Space Angels podcast, Astrobotic has over a hundred deals in their pipeline, all awaiting rides to the lunar surface. This high demand from early adopters, coupled with the fact that commercial lunar transportation is projected to generate multiple billions of dollars in annual revenue by the year 2020 (Anderson 9) suggests that lunar payload delivery is a very real, viable business opportunity for enterprising space startups and their visionary investors. The business goals of private space companies are creating an in-space economy and expanding our presence off-planet. We are on the cusp of a major shift within the global space industry. As government agencies take active steps to ensure a commercial presence in low-Earth orbit and the lunar region, private companies are ramping up their efforts to deliver commercially-viable technologies and services to market in the very near future. For anyone who remembers the palpable excitement of Apollo-era space exploration, today’s space industry represents an opportunity to rekindle the ambitions of decades past; to finally witness the evolving potential of a human presence on other planets, and to meaningfully participate in the current space renaissance by investing in compelling entrepreneurial space ventures. 1. Anderson, Chad. Moon Prospect: Demand for Commercial Lunar Services. July 2013. PDF.